I’m blogging on the Book of Mormon this year with Gospel Doctrine study. This one is for the Abinadi story, Lesson 18: God himself shall redeem his people. Critics look at Abinadi and see a clumsy quoting of Isaiah combined with a ripped off 19th century sermon. A boring old man more worried about his fitness and bodybuilding routine than in preaching the word of God. Literal believing Mormons see an ancient America prophet quoting from the Brass Plates and expounding on the gospel of Jesus Christ as taught by angels. I will explore aspects of historicity, complexity, and spiritual value from my perspective, a faithful but nuanced LDS who believes in the BOM as inspired word of God but not a translation of an ancient record. The most interesting part of the Abinadi story to me is related to the inclusion of the Isaiah passages. Abinadi is arrested and brought to a trial before King Noah’s council. The council asks him a very interesting question, and Abinadi’s answer is even more interesting. Quoting Isaiah which according to the story they have through the Brass Plates. These people claim to be keeping the Law of Moses, so it is a very important text for them. Equating the “good tidings” to the message that a prophet or messenger of God would teach. Trying to trap Abinadi into giving an answer that would convict him of being a false prophet, which according to Law of Moses is punishable by death. What’s unclear is what specifically Noah’s priests are accusing Abinadi of falsely preaching and how they expect him to answer. They seem to expect him to answer in a certain way. Good tidings. The most common LDS interpretaion is the one Stephen Smoot recently brought up in a knowwhy article (love these btw, highly recommend them), drawing on prior work by John Welch. Noah and his priests were taking issue that Abinadi’s message that should have been “good tidings” were actually a real downer for them. Abinadi was telling them to repent, telling them they were wicked and would be destroyed. They did not see this as “good tidings”. So the question and their intent could be paraphrased “What do you think a prophet’s message should be? Isaiah says it should be good/glad tidings and your message is a downer. What do you have to say about that?” This theory is not that satisfying for me. Abinadi doesn’t focus on the glad vs downer angle in his response, and his accusers in the end specifically mention his teaching of Jesus Christ as the reason for being found guilty. Additionally, I’m not a Bible scholar, so I should probably stay out of this, but I think it’s possible the OT “good tidings” is conflated with the NT “glad tidings” when formulating this logic. Law of Moses vs gospel of Jesus Christ. This is a much more promising theory. This tension of Law of Moses vs gospel of Jesus Christ is a theme in the Book of Mormon, and it is what Abinadi spends his time focusing on in his answer. The New Testament provides a little bit of material exploring how the Old Covenant and the New Covenant interrelate, but this is a much bigger theme in the Book of Mormon. We have a time period of 600 years where people are keeping the Law of Moses while also introducing and preaching the New Covenant, or gospel of Jesus Christ. The Book of Mormon spends a lot of time analyzing this interplay, and I believe Abinadi’s trial was precisely meant to emphasize the collision of these two systems. I’m breaking this up into two parts, exploring the dramatic value of Abinadi’s response. a. The question by the priests could be paraphrased “What do you think a prophet’s message should be? Law of Moses or gospel of Jesus Christ?” In this scenario, Abinadi’s response by quoting the very next portion of Isaiah and then spending the next two chapters expanding that chapter and defining it to apply to the life, sacrifice, and divinity of Jesus Christ must have been very dramatic. “Oh you want to know what good tidings are? Well turn the page, and I’ll tell you.” Boom! Noah’s priests’ minds are blown as Abinadi uses the very next passage in Isaiah to make his point. b. The question by the priests could have been very purposefully stated. The verses they quoted were the beginning of the final poem of the Suffering Servant in Isaiah, of which Chapter 52 is the beginning and extends to Chapter 53. There is a modern debate over the interpretation of this chapter, with Christians believing it is prophesy of Christ and Jews and mainstream scholars taking a non-Christological view of it such as of an Israelite king or prophet or even Israel in collective. The author of this passage might have pictured the debate over the proper interpretation of this chapter to already have been taking place in this ancient setting. So the priests could have been very specifically using the beginning language of that verse to ask what the last portion meant. In this case, the question could be paraphrased as “What does a prophet teach, ie what is your interpretation of the Suffering Servant in Isaiah 53?” They are forcing Abinadi to answer whether he believes it to be Jesus Christ or whether he will give them an answer acceptable to them. The Book of Mormon loves to jump into 19th century debates like this and answer them. This is my favorite my theory for what is going on with the question and answer, both quoted from Isaiah. Of course, whenever you talk about Isaiah in the BOM, you have to talk about the Deutero-Isaiah problem. There are various ways to address this within a faithful perspective of the BOM and Joseph Smith. a) mainstream Bible scholars are wrong. Isaiah wrote all of Isaiah including Deutero-Isaiah. b) mainstream Bible scholars are correct but there are prior writings that could be similar to Old Testament passages or sources for OT writings that the Brass Plates might have included and Joseph might have naturally inserted KJV language to translate c) an angel could have revealed Deutero-Isaiah to BOM prophets d) the inclusion of Deutero-Isiah is a modern expansion of Joseph Smith, using midrashic principles to expand an ancient text translated from the gold plates e) the entire BOM is created by Joseph Smith with no ancient text or gold plates, using principles of misrash and pseudepigrapha, which is viewed as appropriate per a nuanced view of scripture and prophets. One of my favorite things about the Book of Mormon is its scriptural exegesis of the Bible. Sometimes, this takes place within the sermon portions of the BOM, like when King Benjamin expanded on the Parable of the Unmerciful Servant in Mosiah 4 with his beautiful treatise into the topic of beggars, or Alma 7:11-12 a masterful exegesis of Hebrews 2:18, and also in this Abinadi passage with Mosiah chapters 15 and 16 being exegesis on Isaiah 53. What I find fascinating is when the actual story line becomes exegesis. Example of this is the comparison of the Exodus and Nephi and his family leaving Jerusalem and being led through the wilderness and eventually to the promised land or the parallel of Paul and Moroni in Ether 12 and 2 Cor 12. 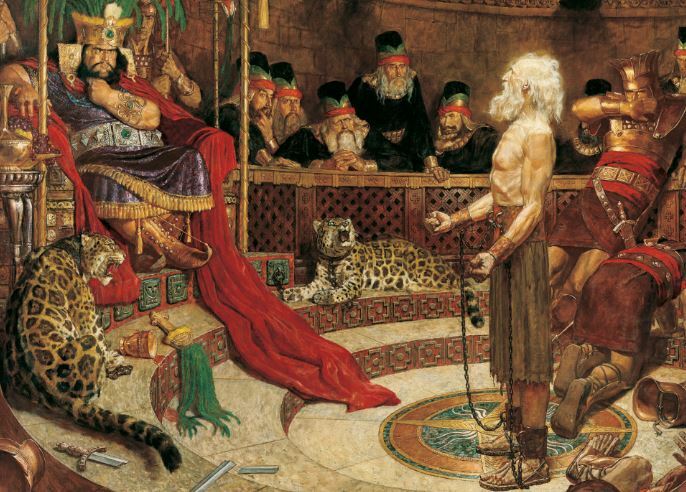 Abinadi facing King Noah in his court and Moses facing Pharoah in his court have some parallels. Abinadi references the Law of Moses, gives the 10 commandments, and refers to Moses as one of many ancient prophets who testified of Christ (John 5:46). This led Grant Hardy, in his brilliant book, Understanding the Book of Mormon, to analyze the text of the BOM and Bible passages of these accounts to look for clues of textual convergences. He found several unique phrases that matched. Who is the Lord, that…? Some of these are somewhat common, some of them more rare, and some of them strikingly unique, such that when combined it must be impossible to think the author of Mosiah didn’t have access to the KJV Book of Exodus. At a very shallow glance, this looks like simple plagiarism, and no inspiration is found. But a deeper look into it opens the eyes and the mind. Grant Hardy explains why these parallels add meaning to the text and the teachings in the Bible. Ben Britton is another LDS scholar interested in BOM-Bible parallels. He argues that to identify the parallel is just the first step. Next if you analyze it to see what the BOM is doing with the Bible text, how it’s expanding it, what it’s emphasizing, what it’s choosing to include, not include, or expand, then you see the doctrinal and inspirational intentions of the author. So, back to the story. Abinadi is asked “what is meant by good tidings?” He starts with Law of Moses, telling the priests 1) y’all aren’t even living the Law of Moses and reminds them of what they actually are by listing the Ten Commandments. Then 2) tells them you don’t understand the Law of Moses because it’s meant as preparatory for the gospel of Jesus Christ. He quotes the Suffering Servant passage in Isaiah 53. Then in the next two chapters (Mos 15,16) he expounds on this Isaiah passage, telling what the vague language in Isaiah means specifically and teaching the full gospel of Jesus Christ. In these two chapters, similar to other “sermon” chapters in the Book of Mormon, we see phrases and ideas that seem to come straight out of the 19th century. breaketh (or looseth) the bands of death (in Abinadi it’s breaketh the bands of death, later it’s loosed) Side note: another interesting aspect of the BOM is when you see new phrases introduced and then you see the dependency within the BOM. Abinadi first introduces this phrase and then it’s used heavily by Alma and really not anyone else. This seems to make sense, since Alma would be heavily influenced by his father Alma, who learned the gospel from Abinadi at this trial. Another interesting case of this is Jacob using language from his father Lehi’s Tree of Life vision. Wherefore in that he suffered for our sins thereby he declared that he was a very pure and natural man Again he gave most certain and evident tokens of his Godhead in that he overcame and vanquished the devil sin and death for if he had not been very God he could not have loosed the bands of death neither have raised himself from death to life. In the fulness of time he on earth in the form of a servant and perfectly holy he was accused of grievous treated with the utmost insult crucified and in the grave and by these sufferings he paid ransom of our souls. At the appointed time bands of death were loosed and by his he was fully justified from all which been laid to his charge he was then exalted the right hand of the Father. By the death of Christ the vail of God’s injured attributes that stood betwixt God and us was rent and removed Christ hath satisfied the justice of God by offering himself a sacrifice. This offering being through the eternal spirit it was of infinite worth and value here the altar sanctifies the gift the altar was the Godhead of Christ the offering was made upon the altar of the divine nature and therefore this blood of Christ is called the blood of God. The sacrifice of himself once offered to God through the eternal Spirit he hath fully satisfied the demands of divine justice affronted by the sins of man and hath procured not only reconciliation but an everlasting inheritance in the kingdom of heaven for all that truly repent believe in him and are faithful unto death. Just like Hardy and Britton suggest to do with Bible-BOM parallels, I apply the same logic to finding 19th century phraseology and ideas in the BOM. It’s easy to see parallel and accuse plagiarism and drop it at that. The BOM doesn’t simply plagiarize things. It collates truth and expounds on it. It expands it, answers it, and uses it to give insights into the doctrine and character of God and his dealings with the human family. This is exactly what scripture or “sacred story” has always been. Perhaps the most talked about aspect of the Abinadi story is Mosiah 15:1-4 where Abinadi describes Jesus Christ using language a little different than LDS usually use. Some accuse the Book of Mormon doctrine to have Modalism in it. Due to these verses above and also some instances in the original BOM that referred to Christ as “God” which were changed to “Son of God” in the second edition. Modalism is considered heretic by Christians. It is the nontrinitarian belief that the Heavenly Father, Resurrected Son, and Holy Spirit are three different modes or aspects of one monadic God. You can think of it as one God presenting himself as either God the Father or Jesus the Son, depending on the situation. Mormons assume this is what Trinity doctrine is, so it’s hard for us to understand why this is so heretical to Christians. But both LDS and Trinitarian Christians would reject Modalism. Trinity is the belief in three distinct personages, yet one in substance, essence or nature. The Mormon godhead belief is in three distinct personages, also separate in substance, but also one in a sense. How exactly they are one is not fully fleshed out. It’s commonly said they are one in “purpose”, but as this verse in D&C 20:28 suggests, there seems to be more about the oneness of the godhead than most LDS understand. All three: Modalism, Christian Trinity, and LDS godhead can arguably be considered monotheistic, though there are valid arguments in that both against Christian Trinity and LDS godhead. Monotheism is a belief in one God. Judaism is monotheistic, though it is believed this was an evolution of sorts with nearly all world religions prior to 1,000 BC being polytheistic and with Judaism settling into a monotheistic belief somewhere around then. This is a point of contention because all Abrahamic religions consider themselves to be monotheistic, so it’s a form of criticism to tell them they’re not. The differences between Trinity and the LDS godhead are very subtle. I like to say that you could put a 12 year old Mormon in an Evangelical church for a year, and a 12 year old Evangelical in a Mormon church for a year, and at the end of the year neither would have any reason to believe the new church had any different beliefs on the godhead. Even the First Vision account of two separate personages would square with Trinity beliefs (see Stephen in the NT). 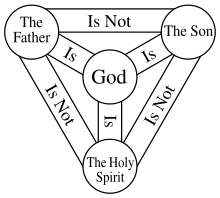 The following is a diagram to explain Trinitarian beliefs, but I think LDS could also use this same diagram to explain the LDS Godhead. Here’s an interesting defense from a 19th century Protestant preacher of very similar sounding language as Mosiah 15:1-4, defending Revelations 21:3 (which is likely a source for the Mosiah verse). Our blessed Saviour is often represented in scripture as a complex person wherein God and man are united so as to make up one complex agent one intellectual compound being God joined with man so as to become one common principle of action and passion Christ wrought miraculous works and yet it is the Father or God in him who doth these works. The God and the man are one And on this account the child Jesus may be well called the mighty God. And God himself is said to redeem the church with his own blood. And to lay down his life for us. This intimate or present union between God and Christ allows him to say, I am in the Father and the Father in me and the Father are one. Some of the language in this Mosiah passage sounds Modalistic but due to the crossover in language between Modalism and Trinity/LDS Godhead, I don’t think there’s a strong case for that. The main point I want to make is that the question is whether the BOM is Modalism or Trinity/LDS Godhead not whether it’s Trinity or LDS Godhead, because the differences in Trinity vs LDS Godhead are too subtle to identify in either the New Testament or the Book of Mormon. Another aspect of these chapters in Mosiah that puzzle many BOM readers is the complexity of the geography and storyline. We’ve got the Nephites going to Zarahemla and meeting the Mulekites, Zeniff’s people leave and settle Lehi-Nephi. The Lamanites are contending with these people. Alma and his people break off. Noah’s priests break off and marry the daughters of the Lamanites. The Jaredite remains are found. All of this is being abridged and narrated by Mormon and in a non-linear fashion. The Book of Mormon is over 500 pages long. It contains over 300 proper names. There are dozens of geographical statements and markers. Though no one can match this up to an actual location, the internal geography is fairly complex and remarkably consistent. It’s not something someone threw together haphazardly. Regardless of whether you think it’s inspired or fraudulent, the historical record suggests the Book of Mormon was created in a short time period. The BOM feels to me like the magnum opus of an experienced writer and theologian, who would have spent considerable time mapping out the geography and the character relationships and integrating the complex textual interaction with the KJV. I know this doesn’t square with the historical record, so it’s a real mystery to me. I’m not big on this line of reasoning to support the BOM as an ancient record, but it does feel like a mystery to me. If Joseph was going to make something up to give him credibility in starting a religion, why do it in such a grand scale with so much risk? As I study the BOM deeper than I ever have, the thought that keeps coming to me: the Book of Mormon is ambitious as hell! Like Nephi and King Benjamin testified, God himself will come down from heaven, take a body, live as a man suffering pains and temptations, so that he can not only redeem his people but also relate to his people. He stands between us and justice. There is us. There is justice. He stands between. Offering something better. He circles back to the original question his accusers asked him. This is what a messenger from God does. Testify of Jesus Christ. Perhaps my favorite part of this story is to learn of the impact of his teaching. Alma was converted from Abinadi’s teaching and went on to teach others. He told them he was teaching them what he learned from Abinadi, but when he invited them to enter into a covenant at baptism, he used different words. Abinadi didn’t say much about how people following Christ should treat each other. He focused his message on the Savior’s life and atonement and the meaning behind it. I find it moving that Alma took this message “he was bruised for our iniquities” and most likely extrapolated out himself that a people worshiping Jesus Christ and wanting to be like him would “mourn with those who mourn”. Ezra Taft Benson took the church to task harshly in the 1980’s for not reading and understand the Book of Mormon enough, going so far as to say the church was under condemnation for it. Out of this focus on the Book of Mormon, LDS scholars like Stephen Robinson and Robert Millet started championing a more grace based view of the LDS doctrine of Christ. As the church followed this counsel from Pres. Benson, it’s no coincidence that outsiders observed the church as “mainstreaming”, going back to basics, focusing on Jesus Christ, stripping away and de-emphasizing some of the radical and unorthodox doctrines that had been debated within the church the prior 100 years. This is a perfect example of what I mean when I say the BOM roots us in that perfect gospel of Jesus Christ, while also allowing modern prophets to seek revelation to fill in the rest of God’s truth. If any of that goes too far, the BOM helps reign the doctrine back in. I’m enjoying studying the Book of Mormon in a deeper way this year. I don’t have a perfect theory for its origin, but I believe deeply in its spiritual value. I accept it as scripture and believe in its power to help us come unto Christ.